At the unveiling in 2014 a boy was encouraged to have his picture taken with an author who had written about children with such understanding. 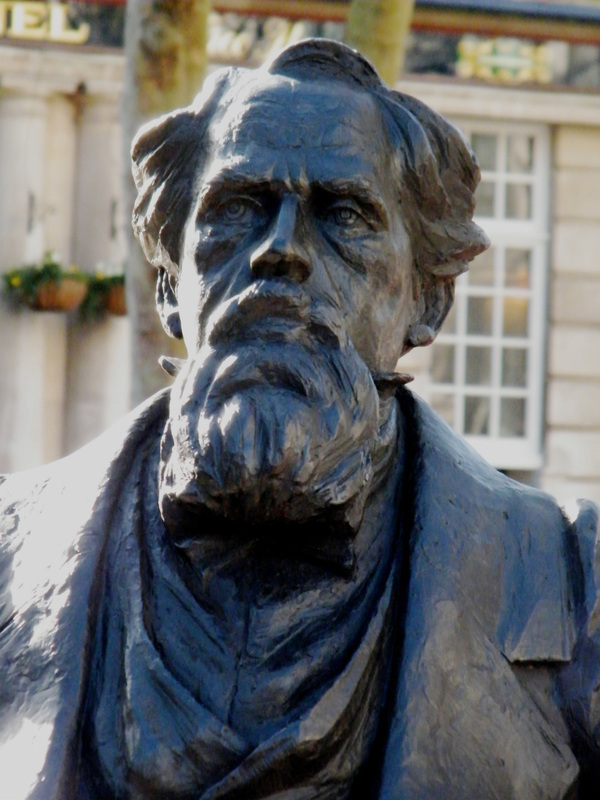 Dickens’s continuing presence in the twenty-first century world is surely reflected in the ongoing films and television shows – some of them versions of his novels, some of them making use of some aspects of a novel and putting it in a different modern context, and some of them biographical on various aspects of Dickens's life. Below is an interactive list of such from the new century, 2000-2015. This listing is obviously not complete, as for instance the movie “The Invisible Woman” (about Dickens and Ellen Ternan) is missing. Havisham IN THE TRADITION OF WIDE SARGASSO SEA, HAVISHAM IS THE ASTONISHING PRELUDE TO CHARLES DICKENS'S GREAT EXPECTATIONS. Before she became the immortal and haunting Miss Havisham of Great Expectations, she was Catherine, a young woman with all of her dreams ahead of her. Spry, imperious, she is the daughter of a wealthy brewer. But she is never far from the smell of hops and the...more IN THE TRADITION OF WIDE SARGASSO SEA, HAVISHAM IS THE ASTONISHING PRELUDE TO CHARLES DICKENS'S GREAT EXPECTATIONS. ~~ publisher's blurb. Sent by her father to stay with the Chadwycks, Catherine discovers elegant pastimes to remove the taint of her family's new money. But for all her growing sophistication, Catherine is anything but worldly, and when a charismatic stranger pays her attention, everything—her heart, her future, the very Havisham name—is vulnerable. from the roomful of Dickens lovers with delightful ease. well thought out, enough to make Smiley think of analogies to Trollope. From a 2008 law professor’s review of Bleak House as “the one indispensable book” for law students to read. 2008 Review by R. B. Bernstein, Distinguished Adjunct Professor of Law, New York Law School, on Norton's re-issue of its 1977 Critical Edition of Bleak House. The first time that I encountered Charles Dickens’s BLEAK HOUSE was in the spring of 1978, in my first-year civil procedure course at Harvard Law School. The grand master of procedure, Professor Arthur R. Miller, was stalking the lecture hall, discussing an issue of complex litigation, holding us in rapt attention. In passing, he mentioned “a real Jarndyce and Jarndyce situation.” Suddenly the spell broke, and he was aware of it. He looked at his 150 confused students and repeated, with emphasis, “Jarndyce and Jarndyce,” hoping to jog our memories. Then he demanded, “How may of you have read BLEAK HOUSE?” Only a handful of students raised their hands; I was not among them. He raised his hands like Moses getting ready to part the Red Sea in “The Ten Commandments” and proclaimed, “All of you should read BLEAK HOUSE. Anyone engaged with law should read BLEAK HOUSE. It is the one indispensable book.” As an obedient law student, I marched to Harvard Square, bought a Penguin Classics edition of BLEAK HOUSE, and started to read. Three days later, I finished the book, dazed and awed. I understood why Professor Miller had been so insistent. My use of BLEAK HOUSE is not an exercise in intellectual nihilism. Rather, throughout the course I make clear that, when my students become practitioners, they will have to cope with the lawyer-hatred that has pervaded Western culture… as what the eminent legal historian John Phillip Reid calls law-mindedness. In that light, Arthur R. Miller remains as right now as he was in that classroom in 1978--BLEAK HOUSE is the one indispensable book. It is the ultimate indictment of law, lawyers, and the legal system in the English language.